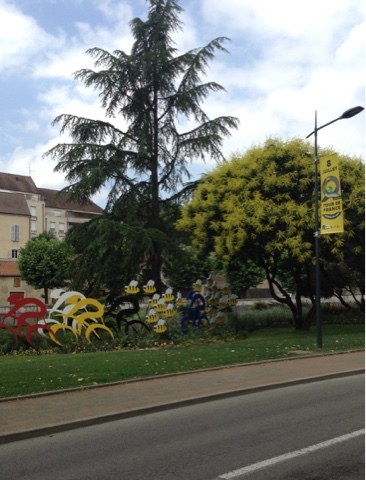 Vesoul, the Ville Départ for Stage Six, is an early front-runner for the beat decorated city of The Tour. As I wandered the narrow streets of this city of 16,000 inhabitants, wherever I cast my gaze there was some tribute to The Tour--yellow umbrellas dangling from trees, bikes mounted on rooftops and in store windows, posters and banners slapped on buildings and bus stops, cut-outs of bikes in flowerbeds, a digital countdown to Race Day and murals mounted on canvas. This was a cycling nirvana and how every Ville Ètape ought to respond to the privilege of hosting a Tour stage. 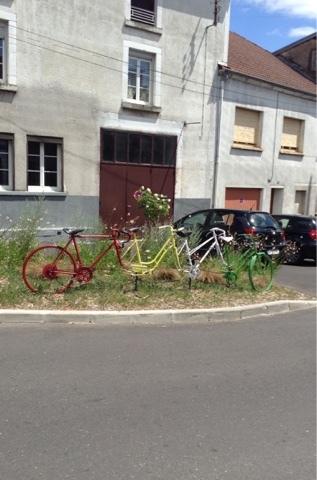 I was glad to be able to leisurely take it all in, knowing that when I pass through Vesoul during The Tour I will be in a rush to be on my way and will be torn between absorbing all its Tour fervor and the need to be getting down the road. Classic photos from Tours past had been hung on walls and fences, each glorifying the majesty of this monumental event. Each stopped me in my tracks, mesmerizing me with all it had to impart. I could become so fully absorbed studying the richness of each I'd have to remind myself to move on to the next. Most were of the racers, but the fans and the caravan were also acknowledged, including Yvette Horner with her accordion, who from 1952 to 1963 was the star of the caravan and was as much of a draw as the racers. She remains one of the great figures in Tour lore. 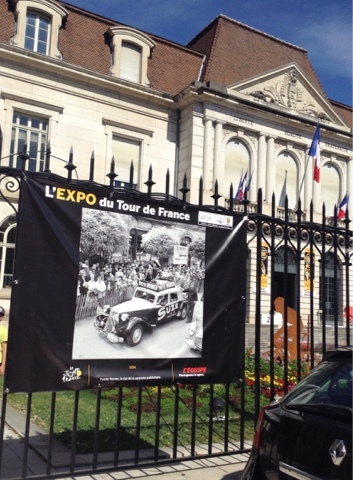 In the large plaza where the peloton will start off from a building was plastered with huge vinyl posters of defending champion Christopher Froome, who will be going for his fourth win this year, and detailed maps of the stage before Vesoul and the stage departing the city. 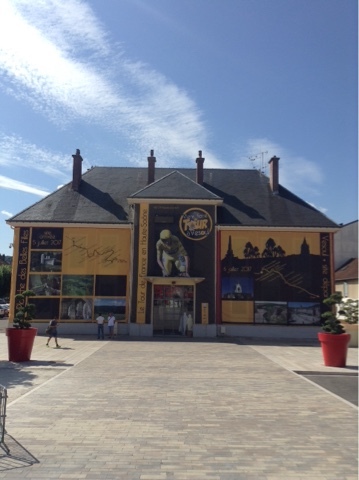 The stage eight Ville Départ, Dole, that I visited the day before, only half-heartedly acknowledged that it would be hosting The Tour. 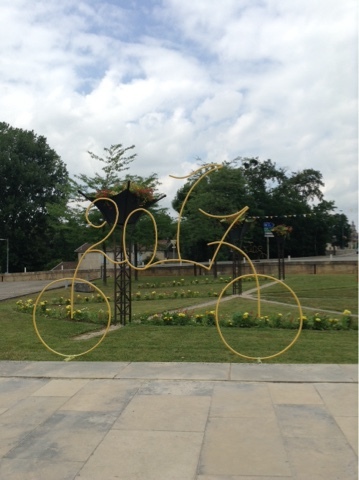 A round-about entering the city of 25,000 had a yellow bike configured with the present year. A cluster of bikes marked the spot across from a large park and sports facility where the stage will start. 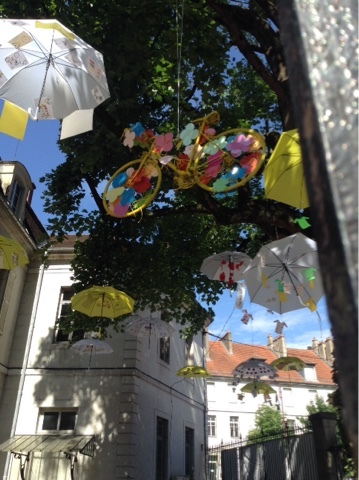 Other than that there were just a few strands of mini-Tour yellow and green and red polka dot jerseys hung across a few streets. 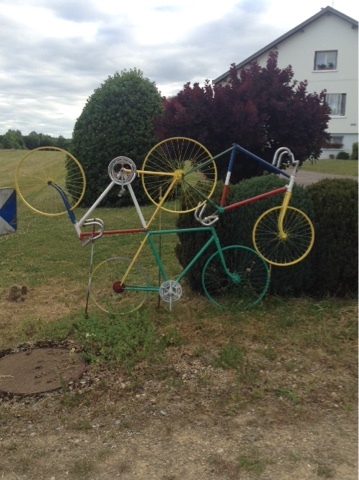 But my sixty mile ride from Vesoul to Vittel, which will be hosting the stage four finish and the stage five start, was partially on the roads the peloton will be riding and it had a rich vein of bike art. 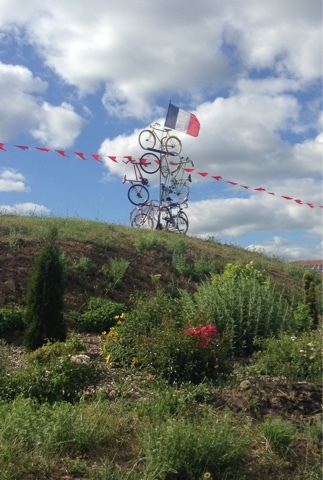 The town of St-Loup-sur-Sermouse, 37 miles into the stage, was decorated as if it were a Ville Ètape. The round-about on either side of the town had a confounding painting that might cause some crashes if the racers allow their gaze to linger too long on it. 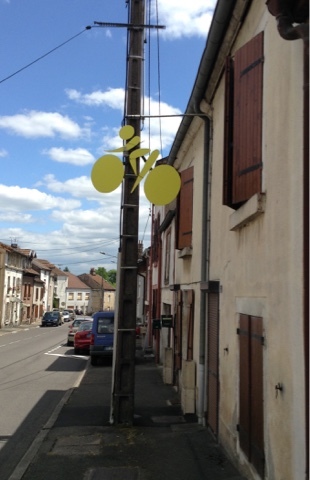 Light poles through the town had blobs and dashes arranged to form a cyclist. 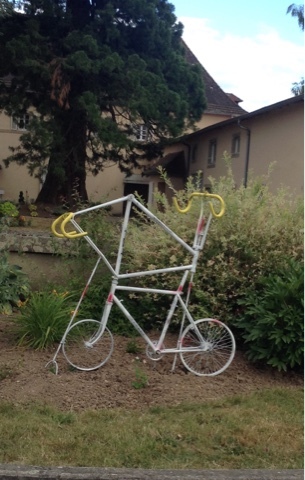 A mad welder had also created some never before seen versions of the bicycle. There were more further down the road. Some made less sense than others. 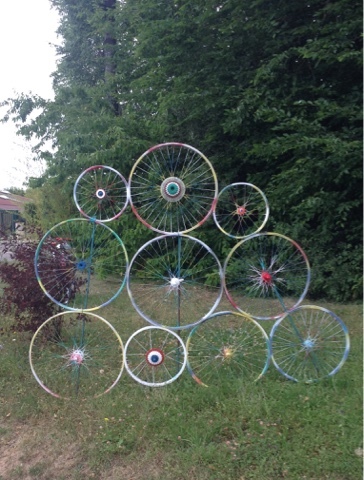 The town of Darney had a series of wheel configurations. Some basic. There were also smaller pallets that were no less pleasing. 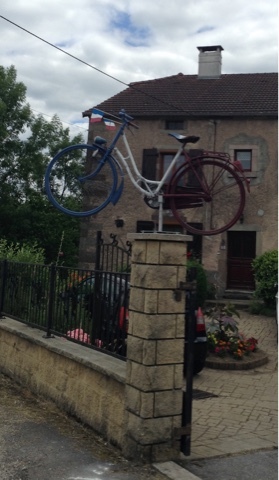 Homes along the road also offered up decorated bikes. 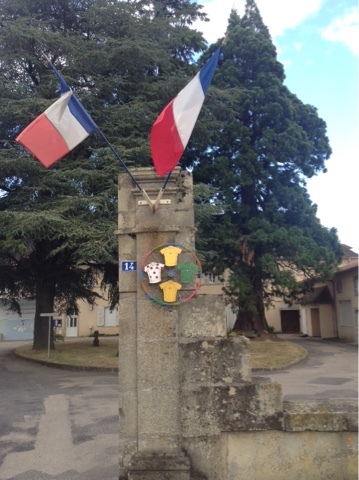 Besides the most popular yellow, some were painted the red, white and blue of the French flag. 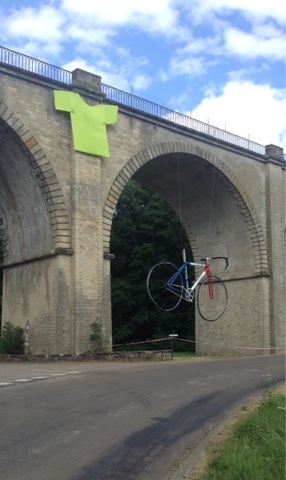 There were a few giant bikes, but none as large as the one hung from a bridge. And this short stretch also included a pyramid of bikes on a hill. And this is just a tiny sampler of a thirty-mile stretch of fhe 2,000 mile Tour route. 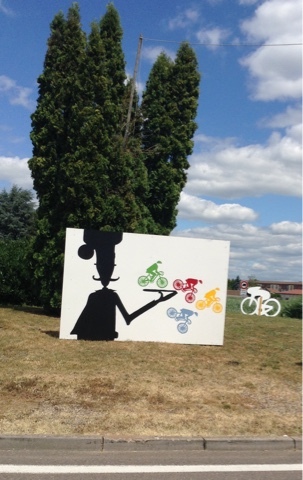 It is most exciting to ride the route when it is lined with fans, but all the bike art makes it plenty exciting even before Race Day. As always, it is an incomparable joy to be experiencing this. The route ought to be packed with cyclists from all over the planet indulging in this pleasure. I regret Janina was too worn out to share in this or that Vincent and Andrew, who have shared the experience with me multiple times and are always tempted to return, aren't here as well, especially as their fellow man from Down Under, Richie Porte, could well become the second Aussie to win The Tour. Only six more days before he will begin his battle with his former teammate Froome. There was so much art to see today that I was held under 80 miles for the first time since I left Notre-Dame-de-la-Rivière five days ago. 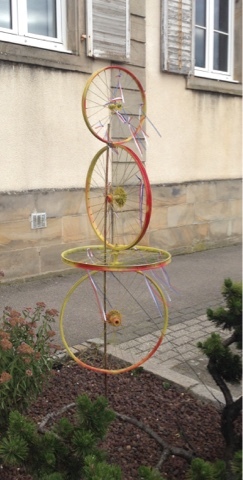 I'm far enough north and into the Vosges Mountains that the heat has abated. For the first time the temperature has been under seventy degrees at nightfall in my tent. Poor Janina is still sweltering, but loving her time with Onni and Craig. She's not sure if she ever wants to leave.